The SMX give 3 options to read the result: Voltage, courent and frequency. Look at the page 3, first schema. I created my breadboard but I have not test it yet because I no expertise to develop a code to read the frequency with a digital read. Someone can share an expemple or an experience? 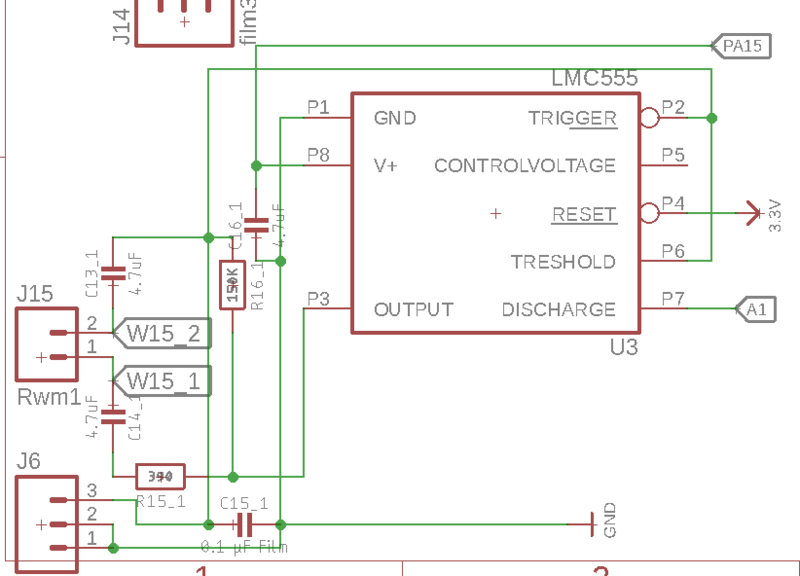 Reading voltage with analog pin is too easy? Ir's not easy has you say. We need two analog pin, one to measure in one sens, and the second when we alternated to power. I spend so much time on this without a good result, that I would appreciate to do it with the SMX electrical interface for Watermark. I am tryinf to find thw right connection with an Arduino to measure the frequency, with pain. Some of you has an experience with it? I know in industrial automation current reading for sensors is often used, I suggest you look into that direction instead of frequency. BTW, why didn't you look at the capacitive moisture sensors that don't have corrosion issues? @pierrot10 I am confused with your question and what parts you have available. 1 If you only have the Watermark Sensor and No Interface. This means you do need to make the interface yourself using at least two control pins to supply the ac power to the sensor, and you need to write the code in a way that will protect the sensor from the possiblity of the damaging conditions. You also have read voltages from the sensor leads and process it to get some useful readings. ie soil resistance. 2 if you have the Watermark Sensor and the Matching SMX interface then node is easy, as you only have to process the final signal from the SMX interface. a) the simplest way would be set the SMX to mV output and then just read that with the node and map it your required values, from the data sheet normal range is 0.2V to 1.0V with 1.7V sensor shorted. The datasheet has the mapping for output voltages to soil resistance readings. b) Setting the SMX to frequency mode and reading it is also not so difficult if the node is not too complex, But i cannot see any advantage unless in a electrically noisy environment, or the sensor is a long distance from the node. The datasheet shows the range between 50Hz and 10kHz that pulse with of 10mS to 50uS so you will need a 16mHz processor to read this. @pierrot10 Sorry i forgot the example code. // if mark-space ratio is equal then only one measurement High time or low time and double it is required. float frequency;    // calculated freqency   1/total time of one cycle. Normally you should apply some signal conditioning and take several readings. Thank a lot for your explication. That help! I use freqency measures because the voltage output need to have an input pf 4.5V. My circuit worj with 3.3V even ifI believe it would work. On PA15, I power the watermark with DIO pin of my microcontroller, and then I take the frequency measure on A5 (work as digitalRead). In that way, I controll the power and power the watermark only when I need. I have 3 time that circuit as I have 3 watermarks to measure at 3 different level. I suppose I should do as you demonstrated. You also mentionned that the microcontroller should be 16Mhz. I supposed it's the minimum requiered? My microcontroller is a 48Mhz. The micro-controller spped has an important on frequency result/calculation? Seeing your curcuit it makes sense now, I saw this schematic in the data sheet but did not really look at the details and skipped over the page. I see you do not have the shunt resistor in the ground supply connection on your schematic so are unable to measure the mV signal. So only the pulse signal is available. Q1. Do you have a pullup resistor on the pulse signal A1 or have internal pullups on the microcontroller enabled? Q2. Is there a reason that you switch the V+ into LMC555 but do not switch the Reset (P4) as well from PA15? Q3	Your code "" percent = duration*100/11000; ""
That does not seem to make sense to me, as when i chart the numbers, it seems to me the most useful range according to the KPa numbers will not be very sensitive with your figures ranging from an intger of 9 down to 0. This was to get the correct frequency, As i did not know the mark-space ratio of the pulses was 50%, ie high and low the same duration. As frequency in Hz is the number of cycles in one second. If we take the time for the High Pulse and the Low pulse and use that to divide one second we get Hz. If they were not the same then the frequency calculation would be incorrect just taking one reading. i would send the frequency value to the controller if possible as then you have raw data to process with no lose of resolution. Unless your controller can only handle 0-100 percent data. for example using info from data sheet. As i do not have a sensor to test it does seem that you may only be getting a good reading of dry to very dry with your scheme. Still that is only a guess as i really have no idea what 100Kpa really means to a plant. What is the purpose of the J6 connector, as i should think that connecting any cable or meter will effect the capacitance and change the output frequency. Realy a great thank for your reply.It's too late now to answer of all of your obersvation (it's 1.30 am at my place), but I will take care of this tomrrow. I build the circuit myself and I was not sure about the Film capacitor C15_1. I juts add J6 in case I make a mistake about C15_1. In that case, I can add a different capacitor on J6. But it should remind open and remove it later unless C15_1 (SMD) does not match. I have a doubt about C15_1, but not about the no-SMD capacitor that I can place on J6 holes. About Q2. Yes I thought to connect to PA15 instead of 3.3V. I though there is no impact if I keep RESET permanentely to 3.3, but I can have it to PA15, when the DIO of my processor is HIGH to power the SMX circuit. About Q1: I didnot foresee a pull up resistor on A1 and Ido not know if my microcontroller has one (Adafruit Feather MO adalogger), but I will check it tomorrow. It is mentioned in the SMX instructions and on the ti data sheet it clearly mentions the discharge pin being open collector. I like to use external pullups normally as it gives more control. check if you have the internal pullup set. I was going to try the circuit on a two pronged eBay sensor, but i cannot find any of the LMC555 or other cmos variants in my hoard of parts. I am sorry but I was busy with another problem that now I fixed. First of all. The Analog (A1) has a pull-up resistance. Secondely, you asked me why I do not use the kPa unit instead of percent. float frequency;                      // calculated freqency   1/total time of one cycle. and I need to know the value of 'kohms' which is the resistance of my watermark sensor when dry or wet. I guess my mistake is here because, I actually a Watermark resistance of 10000000 ohm. Then how can I get the right watermark resistance value from frequency and then use it with the following formul to get from 0 to -199kpa? Then How can I calculate wrm (Resistance of watermark)? Well i think that 48Hz is good for a very dry sensor or disconnected unit. If you do not wish to get the sensor wet, you could try connecting various resistors to the input to simulate the sensor and vary the frequency signal. I have not included any temperature conversions from Fahrenheit to Celsius so each function uses the temperature as per the data sheet. My code is just quick and simple just to get started. // test program to test Watermark Sensor using the SMX interface using frequency mode. // Watermark Sensor SMX interface Hz to Resistance lookup table per SMX.pdf page 6. // Watermark Sensor SMX interface Resistance to SWP kPa lookup table per SMX.pdf page 7. // for increase of 1°F increase resistance by 1%. // Adjust compensate resistance for temperature. Ouha, your are a genius!! I am going to look at this deeply. I keep you up to date! It's a huge, great what you wrote!!! Thank a lot for your code, I tested it. I always thout that -332 was a error as I was convinced that it could not exceed -200 and SWP is always negatif from 0 to -200. So what is more relevent between kPaCalc and kPaCalc2? According to the manufacturer’s sensor specifications, the rated range of measurement of the Watermark 200SS sensors is from 0 to −239 kPa, although the normal usable range is from 0 to −200 kPa, where a reading around 0 kPa would indicate that the soil is at or near saturation and a reading at or near −200 would indicate a very dry soil with little or no plant available water. There are several types of commercial loggers that can automatically read the Watermark 200SS sensors at specified time intervals and store the collected data, and a device to manually read these sensors is also available (Figure 1(b)). I conclude, the best way is to use your proposition kPaCalc() because you consider the manufacturer TABLE1 value (page6) but your value is positif. Do you have idea about positif vs negatif kPa value (200 or -200)? I also conclude that my result was not sur wrong, while I expected it as obsolete :). Should I better follow your example as your "hard coded" the table value? Now my main worries is about negatif SWP value vs positif SWP value. I have not tested your routine, but i did test my two functions. With what input resistance figures did you test with? The kPaCalc() using the lookup table has upper and higher limits so only shows the ranges 0 to 200 kPa the same as the data sheet smx. However if you compare the outputs for the normal range 550 ohms to 27950 ohms. 27950 ohms in bone dry soil, 199 kPa. That is at 75 degrees Fahrenheit, 24 degrees Celsius. within this range the outputs of the two functions are similar and both positive. You will need to invert both of them if you require a negative value. However all of the above is theoretical, as you should need to test your actual sensors in soil the same as the final position and calibrate to the real Wet and dry soil readings. What are you going to use the data received from the sensor for? Hello,it's verry interresting what you shared. Today I left the SMX input open. No sensor no resistance. I discovered, I get the same value when the sensor is in a fully dried soil. And I did not have the sensor with me. Yes, I have a box that I fill up with soil of the crop where the sensors will be for the measurement. 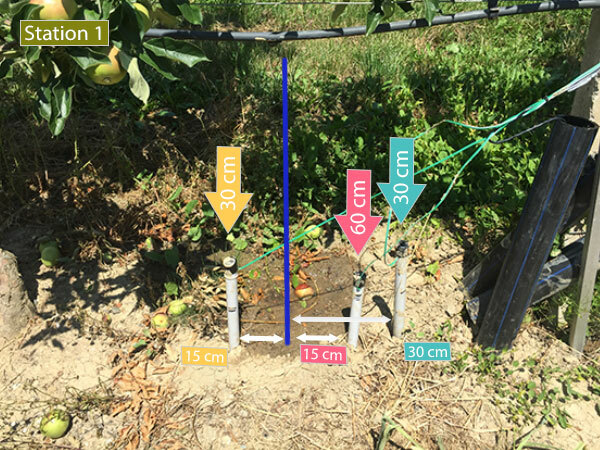 We only want to monitor the soil moiture from June to Septembre and the result will be display in a graph. But at the final, as I understood, what is relevant is from 1220Hz to +/- 310hz (from 550Ohm to 27950). From 27950 and above, the soil is fully dry, whatever if the kPa goes to -1300 or -352. And from 550Ohm or below, the soil is fully wet. Yes i think that is correct 550 Ohm to 27950 Ohms is the range for the watermark sensor. For the SMX module with input open no sensor should be 48Hz as you have already discovered, and if you short the input terminals out you should get 13233Hz so total range of the module is more than the sensor. I think, now it's clearer for me. As we use watermark to measure the soil mostire, wehave to consier the range of 550 to 27950 which match with 6700Hz (more or less) and 310Hz. What is below or above is not relevant for moisture measurement with Wathermark. Yes I do agree that is how i understand the operation from the data sheet. My main concern in the long term would be the sensor connections being corroded and the sensor resistance becoming open. So error checking for higher or lower than normal values for sensor fault conditions might be worthwhile. I do not know if you are still around and if you can help me a bit. Dont pain attention at 'alternative'. It's alway true and I will clean the code. 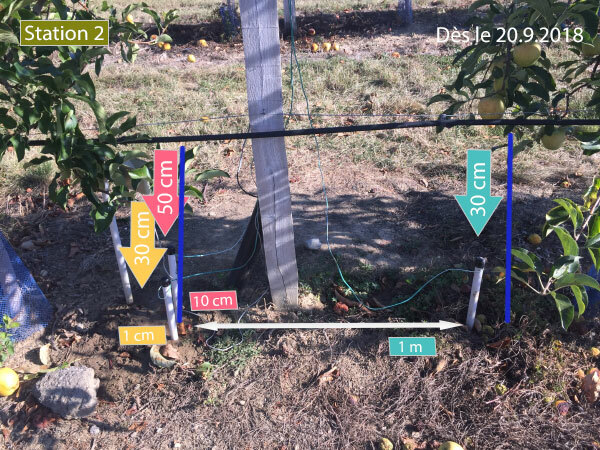 delay(1000); // Need to have the sensor "in equilibre" with the soil. Should it be not 16? yes you are correct, it should be 16. I ma still doubting about my SWP value returning by my sensor and by the code to calculate it. But I was always suspicous about the SWP value. I also bout a WATER digital reader and the values never matched. All the graph/line of Station3 is calculate with a temperature of 24Celcul. As sensor is in a room where the temeparture is between 24C and 28C, a small tolerence must be "accepted"
but never use it. The result is wrong. I compared with datsheet of the Isometer and the result never matches. In order to be fixed this question, I used my LoRa node to send the wrm, swp and a second swp to my server and observe the diffrence. Station 1 and 2 are two station on fields. The red line is the WRM in Ohm and not ml/h (I have not change the unit). It's interresting to see that the kPaCalc() progress as a step and stop at 100kpa and jump at 200kpa only when the wrm is 27950.
so the wrm will not be display higher than 27950 even if it can go over 27950 as say the doc. The equation of Shock look perfect and I controlled it with Watermark data reader. The result is similar with a tolerance of 5-10kpa. From graph (See Station 3), I also compare the WRM and the SWP from the doc (see page 7) and SWP value matches. you do not consider a SWP between 100kpa and 200kpa. I thing it's very interresting to have value from 100kpa and 200kpa, as 100kpa is the moment when soil need to be irrigate and more we come close to 200kpa, more is dangerous. In any case, your function kPaCalc2() from the code you provided to me, 3 mounth ago seems to be best. @pierrot10 the red violet line on the chart is showing an error in the processing as it should not jump in stages. The error has appeared as you changed the original code from using float for ResistanceInput to Integer, however there was also a error in the orginal code that did not show up when using the float inputs. to use ResistanceCompensated which is in float format. the red line on the chart is showing an error in the processing as it should not jump in stages. Hello, what do means by jump in stage with the red line? @pierrot10 I meant the violet line should be a smooth similar to the yellow line. This morning I soaked it again the sensor into water for about 1 hour and I let it dry under the sun. It looks now really better ( See Station 3 ). I am happy with the result specially for Station 1 and 2 since yesterday 12h (UTC). Thanks a lot. In any case, thank a lot for your great help. Your participation helped me a lot and I would like to thank you again. Now I am very happy with the result. I still keep an eye on it. First I planted them in 3 different level: 15cm, 30cm and 45cm. Then I replanted them to try to observe the bulb of water: I planted them at (distance/deepth) 15cm/30cm, 15cm/60cm and 30cm/30cm from the point where drop the water. (I also make sure that all sensor have a distance of 30cm from each other to avoid interfrences). But as the ground is tilted, the drop do not fall where I expected. When I planted them into the soil and see the difference of the result. Do you have any suggestion to plant the 3 sensor? In any case, tanks a lot. You helped me a lot. Enjoy the end of sommer! Hi pierrot10 thank you for letting me know how it is working. I am glad to be of some help. I have no experience of using the water sensors, I only looked at the data you posted and made a mock up of the converter module for testing. My gardening is limited to two small potted plants that live on a window sill and have a capacitance sensor in each pot. @suhaila96 Hello I have not seen your question since I reviewed this topics, today. What do you mean about "setup your circuit"? How did you connected you watermark sensor and to what?